The July CAA News has been posted to the CAA website. You can download a 1.6-megabyte PDF of the issue by clicking on the cover at right. 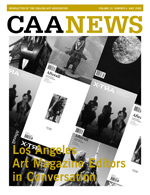 In the issue, CAA News talks to the editors of two art magazines with roots in Los Angeles: X-TRA and Afterall. Also included are CAA’s new procedures for developing professional standards and guidelines; a report on the recent Board of Directors meeting in May; and information on registration rates for the upcoming Los Angeles conference and travel grants to attend it. The deadline for submissions to the September issue is July 10, 2008. Please send yours to Christopher Howard, CAA News editor.